First product in the SFB game system. Command a starship! What you saw on the screen, you can do for yourself. 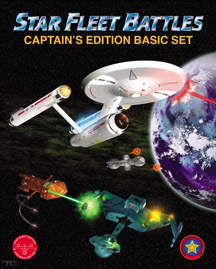 Basic Set is the core of the Star Fleet Battles (SFB) game system. Includes Federation, Klingon, Romulan, Kzinti, Gorn, Tholian, and Orion. Note: This boxed game includes the updated 2005 rulebook.